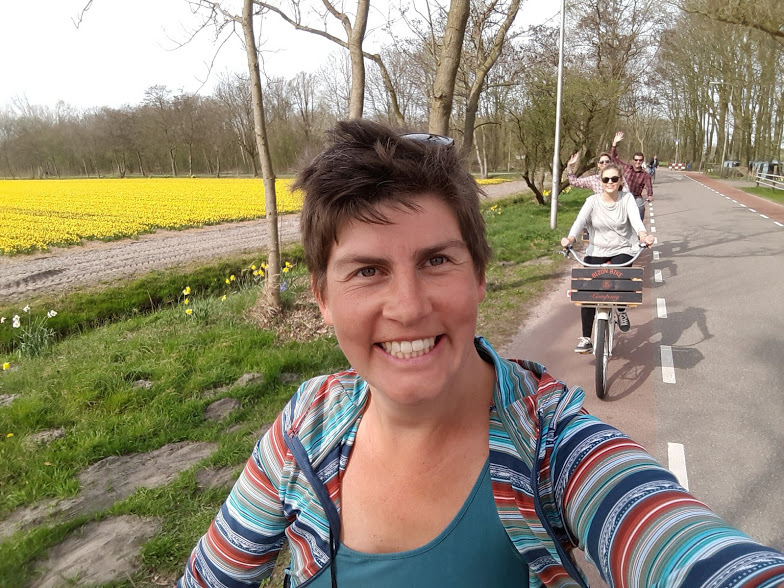 Cycle selfie, even a more difficult flower field challenge! Tulip fans, hyacinth lovers and daffodil enthusiasts, are you ready for a flower field challenge? Spring 2018 is all about taking the best selfie in the flower fields near Keukenhof. Everyone can join this challenge. There’s just one rule. When you participate in the flower field challenge you thank the designer of the tulips, daffodils and hyacinths for their work. Imagine you are a fashion designer. You have this fantastic idea for a shirt and work on it for 10 years. When it’s done, it looks amazing! The colors are dashing anf the soft fabric make the shirt look caressable, but also extremely fragile. You put it on display. Everyone loves it. They take pictures of it, they touch it, they move it around. The shirt looses its glow and at some parts is crumpled, even torn. The shirt you worked on for 10 years, it feels like a lifetime, is destroyed. How would you feel? Bulb growers protecting their life’s work Copyright Vidiphoto. A visit to the Keukenhof area is different every year, every day, even every moment. The bulb flowers come to bloom in front of your eyes. And every year there are tulips, daffodils and hyacinths in different shapes, sizes, colors, scents. The spring flowers are vulnerable and easily catch a disease. Especially the hyacinths. When we walk through a flower field, flower diseases stick to our clothes. When we visit another field, we spread the disease. Precious flowers die and the beauty of the flower fields is gone. These bulb flowers deserve a long life. To live long, they need you. Did you know that it takes 10 years to create a different, one of its kind bulb flower? The flower field challenge is about taking the best selfie. For this you need a beautiful field of blooming tulips, daffodils or hyacinths. Now the trick, or only game rule, is to take this amazing power flower selfie outside of the flower field. So without touching the fragile bulb flowers and without entering the flower fields. Yes, it’s tricky, but I’m sure you can do it! Will you participate in the flower field challenge 2018, show your love for the fragile flowers and take a power flower selfie without touching tulips, daffodils or hyacinths? Do you really want to come close to tulips, daffodils and hyacinths? Visit Keukenhof, the different tulip picking gardens and tulip farms where you even get to meet the bulb growers and gardeners! And if you want me to show you the best flower fields and places where you can get close to the spring flowers and interact with the flower designers, contact me.